During the summer months, when the temperature in Paris shoots up to nearly unbelievable heights, it turns my up-on-the-rooftop apartment into a furnace, and many nights dinner will be enjoyed on the roof, overlooking the city, watching the rest of it cool down after a broiling day. Somehow, my apartment doesn’t enjoy the same cool-down period, perhaps its the price I pay for being closer to the sky? Because the roof is quite pitched, I’m always careful about not having a glass of wine with dinner. But if for some reason you ever stop hearing from me, well, c’est la vie. This is a pretty quick recipe I tossed together for dinner tonight. A friend I was corresponding with sent me a message earlier jokingly noted that some of my recent posts were voluminous, so this one will be short and to the point. I promise. For many years, raisins and other fruity things were forbidden in my cole slaw. But over the years, I’ve softened my stance and I’ll allow it. Especially when you have a gorgeous, hefty-ripe mango from the market, raring and ready to go. 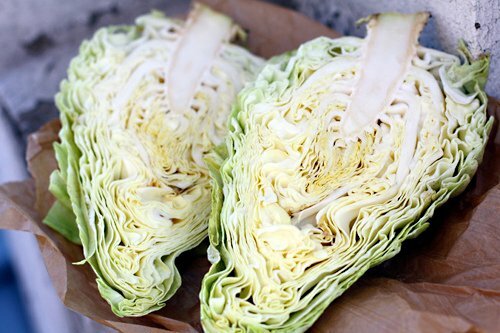 I’d also bought a cabbage at the market last week because it was so pretty, with it’s gentle torsade-like swirl. I’d seen one in a French food magazine, gently seared, and thought I’d do the same. It’s called a Chou Cabus Cœur de Bœuf Moyen de la Halle. And if you wonder why I need a glass of wine with dinner, after a day of shopping for ingredients, now you know why. But it was so big it didn’t fit in my refrigerator, so I had to use it pretty quickly, hence the darkening stems. You can make this crunchy salad very fast, especially if you marinade the chicken in advance, preferably overnight. I let mine sit in a handful of Italian herb rub that I make every winter, add a pour of olive oil, and some dried Korean chile pepper powder, which seems to find its way into almost everything around here. Then I simply fry them on the stovetop, so I don’t need to turn on the oven. You can also toast nuts on the stovetop, although I find ten minutes in a 350ºF (180ºC) oven does a better job. So if you wanted to be extra-efficace, you could oven roast the chicken at the same time as the cashew nuts. This recipe, of course is open to all sorts of variations. Roast pork, especially the kind sold by Chinese butchers, is wonderful. Or vegetarians can use sautéed tofu. No mangoes? Try orange segments or slices of nectarines.You can use Romain’s French vinaigrette recipe, or make a batch of your favorite. For slaw like this, I like to enliven the salad dressing with a bit of soy sauce, balsamic, or a few drops of toasted sesame oil.In the summer, I like my dressings on the vinegary or tart side so although I didn’t have any limes on hand, I’m sure a squeeze of lime juice would add a nice tang to the salad. 1. Put the vinaigrette in a large bowl. 3. Divide into two bowls, and serve immediately. Do Ahead Tip and Notes: This slaw loses its crispy-crunch if allowed to stand too long, so if you want to do any of the chopping or making the dressing in advance, that’s fine. But don’t toss the ingredients with the dressing until the last minute. In lieu of the toasted nuts, if you don’t feel like turning on the oven, toss in some honey-roasted or dry-roasted peanuts. Or use my recipe for Candied Peanuts. 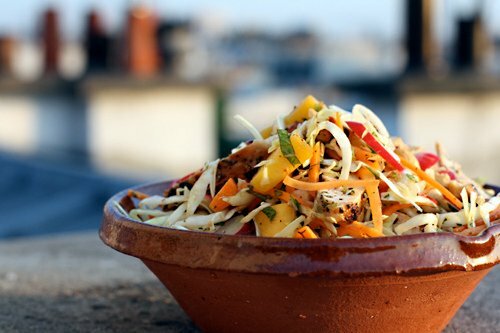 I love the combination of cabbage and mango in slaw. The chicken would just be perfect in there too. Hi David…looks like a perfectly refreshing & healthy dinner to have on the rooftop on a night like tonight! Thanks for the inspiration…you’ve got me thinking of doing a spin off with some leftover grilled duck breast and honey aoli sauce. I’ve almost sworn off buying cabbage … I love the idea of it, but unfortunately it always winds up in the poubelle before it gets used…..must try again! Whoa. 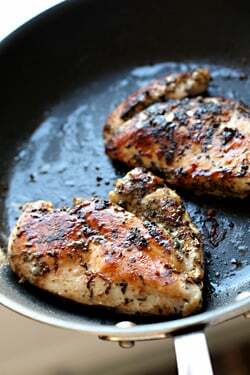 I really want to make this tonight for dinner! I love slaws that don’t include a ton of mayo — thanks for proving it’s possible! The friend who told you to write less is terribly wrong! Quelle idée! Your verve and witty prose are part of the greatness of reading your posts. Is that the base to a tajine that I see? For me, coleslaw is not a place for fruit, nuts, or meat – I’m pretty picky with my coleslaw – but slaw, on the other hand, has a much more broad definition in my kitchen. I think I’d make this Thai-style, with a fish sauce vinaigrette, peanuts instead of cashews, and maybe green mango instead of the ripe. I am planning to make the Mustard Roasted Chicken Thighs from The Wednesday Chef in the next week … and I think I figured out what to do with the breasts off of the unlucky chicken! Great sounding recipe that gives flexibility in wine choice. And, I’m with Sharon – write all you want; it’s a pleasure to read. This looks good, maybe I should make this for dinner. Sorry it’s so hot but dining on a rooftop in Paris sounds pretty cool! Your recipe looks great, but there is no mention in the recipe itself of searing the cabbage. Am I missing something? Rooney: That’s what I intended to do with it, but as mentioned, it wasn’t going to last too long, so I used it for this slaw instead. Dining on a roof top in Paris…that’s way more romantic than any dinner I’ve had in, well, ever! Short posts or long posts, you always deliver. Excuse me – but some of us ENJOY when you go on! So please don’t listen to that friend. Those who don’t find you as entertaining as the rest of us can skip right down to the recipes. But some of us love the tangents, meanderings and trivia. So please, ramble on! And thanks for another fab-sounding recipe! Wow. Chicken and mango are my go-to staples for summer salads which is making me wish we weren’t having the coldest mornings in Sydney for about 50 years!!!! Can’t envisage being warm on a rooftop, but think that a navel orange variation may well be on the cards for supper.. I have a thing for cabbage.. yum. Oh hmph, those who want your prose shorter are too rushed. Long posts are for savoring, and your *friend* can’t savor while charging about. Please do go on. David – Be voluminous – that’s the fun part of your posts…. Dear David- I live in the US Virgin Islands… and I must say, any mangoes you are enjoying are lackluster compared to the pluck-your-own-off-the-tree ones we have here. Feel free to take the daily flight from Paris to SXM (St. Martin) and then the 90 mile hopper here, no need to take my word for it. My guesthouse awaits you, and the passionfruit vine over the front door is fruiting like mad. I assure you, you are welcome by all means. This is a great recipe. I like the combination of the chicken and mango. It looks so refreshing. Thank you so much for sharing this recipe. Guess what I am having for dinner tomorrow night! Thanks for another wonderful recipe, David. By the way, I just read Dorie Greenspan’s latest blog piece and I noted with delight that the photo that she has on her site of herself is by none other than you! What a wonderful compliment to you. And I agree that you should ignore the suggestion to be less verbose. Your sense of humor is one of your best qualities. I laughed out loud tonight when I read the part about the pitched roof and the wine. You are a hoot!! I love it. David – this salad looks delicious and then I clicked over to the Italian herb rub post. Apparently some things never change – the rolled up towel at the bottom of the bedroom door trick doesn’t work any better for my teenage boys than it did for you. I’m definitely going to make this “stash” and then the salad. Thanks for the recipe and a good laugh. I’m with everyone else on this – write away! We love reading you! And thank you for sharing this refreshing summer recipe, I can’t wait to try it. Looks like a great recipe to take to a 4th of July potluck. Your blog posts are great – don’t put a line limit on yourself – keep them coming. Sharon, Laura, Sue, Grapefruit & Karen: Well, Dianne is an editor, so that’s her keen eye at work. And she told me the comment wasn’t criticism; it was just an observation. Don’t worry—my next post is going to be long enough to make up for the terse nature of this one. . . This looks super tasty. What a great way to turn a side dish (a slaw) into a dinner–great for summery, easy eating. I think that fruit and nuts make a nice combination with coleslaw, like sweet potato, raisins, apple, and almonds together. Thanks for the inspiration. Great summer recipe. We’re experiencing a small heat wave in Holland (I guess northern Europe is getting jealous of southern Europe) so this is just perfect! Chicken, fresh coriander and mango, I am getting hungry! That pointy-headed cabbage is available here too, and it is so much sweeter than the regular. Temperatures are way up here too. I was out to dinner last night and it all felt very mediterranean, dining until midnight outdoors. I hope you manage to stay cool up under the roof! 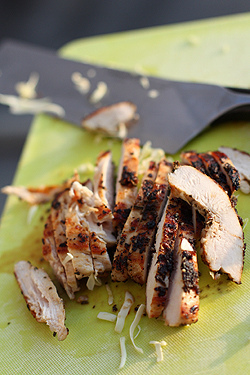 but how do you grill the chicken as shown? Count me as another of the “Loves David’s crazy ramblings” crowd. Short and sweet is why Twitter was invented! David, I love the bowl you have the slaw in- is it terracotta?Also, is there a name for that cabbage? Yours looks kinda pointed- I’ve only seen round ones here in the states. whether short or long your stories are always enjoyable! The colors in that slaw are just gorgeous. I love the idea of mango in it, too, as it can sub for the sugar that’s usually too abundant in most slaw recipes. I’ve found that when I take the time to salt and drain the cabbage for about 20 minutes after shredding it, the cabbage stays crunchier even after sitting in the dressing for a while. It is mango season in Mexico, one of the perks for enduring such a hot summer. I am temped to put mango in everything, but they are so good straight, we usually just eat a bowl of sliced mangoes or add it to breakfast smoothies. Right now, mangoes are 20 pesos (about $1.80) per kilo. They fill the house with their perfume. Your posts never seem long to me. Please don’t change! I’ve been struck down with a summer cold, which, in combination with the heat, has completely killed my appetite. This sweet-and-tangy salad of yours, though, actually sounds like something I want to eat! And is it really cooler on the roof? The zinc roof on my old building used to get so hot on sunny days! Tell that friend of your’s to pipe down. Some of us like reading what you have to say. 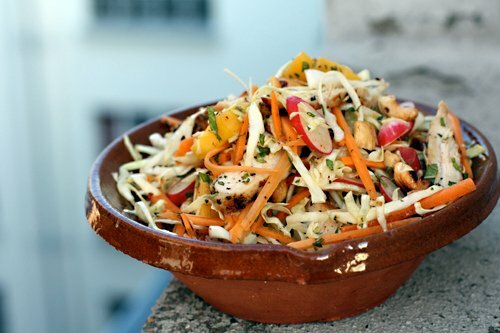 I have had apple slaw and mango salsa but never mango slaw, now I have to try it. I’m taking a pole, Where are your favorite places to visit in Liguria? Thanks for alerting me to Dianne’s new blog-lots of useful infor there. Slaw and cabbage in general are totally underrated side dishes. Just read Mark Bittman’s latest NY Times article suggesting grilling the cabbage first-might be intersting. 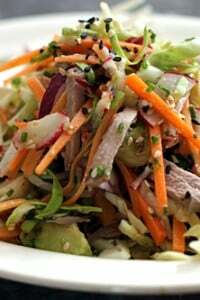 I’m surprised that you have not come up witth a kimchee slaw David. I’ve been making your kimchee for a year time and it is fabulous-been doing some crossover Mexican/Korean and Indian tacos. Sounds weird but surprisingly yummy. This truly is a perfect salad for a toasty Summer evening. I love all the textures and flavors with salty, sweet, crunchy and spicy! I will have to prepare this recipe one night soon because it is almost unbearably warm in the evenings here in the South. This would be a nice way to cool down. I’m looking forward to being a frequent visitor to your blog. PS Had to laugh at your travails re: learning French. Am going through a similar process with Spanish …if you want a truly humiliating experience though…try ballroom dancing. Indeed; you can be terse on Twitter! Please don’t be on your blog. That cabbage, incidentally, looks like the Sweetheart cabbages that are ubiquitous here, and definitely one of the nicest kind, with a great flavour. Great recipe! I’m new to your blog so I appreciated the link to the vinaigrette. A friend of mine here in Mississippi has a French friend who makes a great vinaigrette. She shared the recipe with my friend but didn’t mention a certain ingredient that she let-slip later in a conversation; she was shopping and saw Maggi in the store and said she needed it for her vinaigrette. We also like to use Maille’s walnut vinegar but it is so hard to find in the U.S. Do you suggest it? this looks AHHH-mazing! thank you for sharing, david! i love your long posts! please don’t stop!! Allen’s people. Thanks for your insights. I really enjoy your postings. Your friend must have a short attention span. for all of your followers. Please feel free to digress and ramble on as much as you want. Your posts are always wonderful – the longer, the better! Woohoo! What a nice surprise to walk into my living room tonight and see you and Eve sitting there having a chat. Great looking salad! Looks tasty. I love the picture of the cabbage, but I have to admit that your description of them as having a “torsade like swirl” threw me for a BIG loop. Torsades is shorthand for “torsades de pointes,” a fairly serious cardiac problem that sometimes requires immediate defibrillation. So when I skimmed through the post and happened to see the word “torsade,” my natural instinct was to gasp! Glad to see the word being used in a much nicer context! I think I’ll give that one a go. We love fruit in our mains. I like a sharp dressing too, 50/50 is what I like best. We get cabbages like that here, well at least I think they are the same, but called ‘pointed cabbage’ imaginative marketing there then. Deborah: In French, it’s means ‘twist’, which is how the cabbage looks (sort of) when whole. They’re really lovely. One could use regular cabbage or Napa (Asian) cabbage, too. Marlene: I try to make most posts readable within two minutes, since if folks are anything like me, they don’t have a big attention span. I used to do a lot more short-style posts, but now with Twitter, I can post short things there, too. bob: I’ve not used Maggi, but I know it’s popular in Europe and Asia. It’s not really an American condiment, although perhaps I should pick up a bottle someday to play around with. A friend and I made the Chicken Mango Slaw last night. We followed the directions for both the slaw and vinaigrette dressing including your suggestion to add a bit of soy sauce and toasted sesame oil. We cut the amount of cabbage in half because we were sure it was too much to eat. The texture and colors of the final dish were very inviting. The mango was perfectly ripe so we used the whole one. We also used fresh chives and a squeeze of lime. We felt that the dressing needed more punch. I tend to like a more vinegary taste so I add more sherry vinegar and mustard. But still the taste was too bland. Maybe that was the intent. We ate the slaw with a wonderful rosé from Cote de Provence. I tried the leftovers this morning to see if the taste was more interesting. It was better and not a bit soggy. I think I will make it ahead next time. Your blog is great fun. 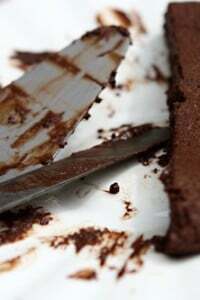 I have made several recipes from The Sweet Life in Paris! I always add about 3/4 cup of wine to the tagine recipe on page 40. David, I am making your rib recipe and carnitas from ‘Sweet Life’. I have Margarita sorbet from ‘Perfect Scoop ‘ ready to churn. I may as well make your slaw recipe! 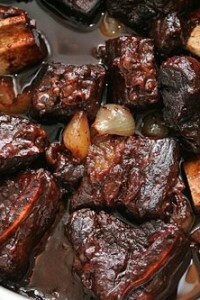 I love your honest, unpretentious recipes and know I can count on them to be delicious. Have a good 4th of July and thanks for making mine a feast! I can’t bear to think of you pitching off your roof, wine glass in hand. Wear a harness! I love your writing so please don’t change! You are my link to an exotic life very remote from mine. (though I love mine as well) – oh, and this dish looks amazing! made the slaw for bbq yesterday– w/o the chicken– it was with ribs and burger and hot dogs… it was unbelievable. there was none left!! the vinaigrette was beautiful, and i added tons of mustard by the way. thank you! yes! this will be dinner for tomorrow. Please add me to the legions of devoted readers who LOVE your long, rambling posts! It’s like hearing from an old friend – you don’t want any details left out! What a gorgeous summer salad David! I’ve never seen a cabbage that shape before. This will definitely be on the menu at my house some time soon. Thank you. No, no! You are my favorite food blog for the very reason that I love the way you write, your humor, observations, and insight, the more lengthy the better! And you don’t write often enough! I tried making this last night. I used broccoli slaw instead of cabbage because the cabbage at my market was so sad looking. It was terrific. Thanks for posting it! I just made this tonight. I’m sure the recipe is delicious as written, but I made a few changes due to what was on hand, and I simply HAD to let you know about it because it turned out to be a fantastic variation! I rubbed the chicken breasts with yellow curry powder before sauteing them, and replaced the cashews with toasted almonds and toasted coconut. I left out the radishes, and added a bit of honey to the French vinaigrette and squeezed a lime on top at the end. Thank you for the inspiration David! Becky: Yellow curry powder and the other tropical touches are a great idea! I don’t usually have curry ingredients on hand but it’s great you did your own variation, since this recipe was inspired by what I happened to have on hand. Yours sounds delicious, too! 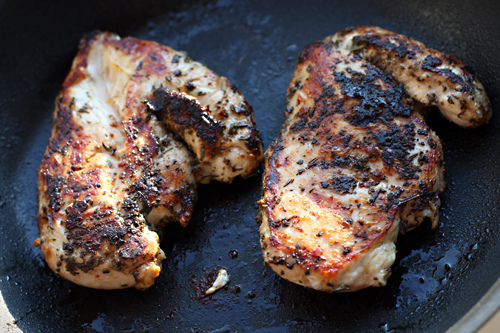 Your chicken looks good enough to… well, drool all over. This is the perfect summer salad, I can’t wait to try it, and definitely with those candied peanuts. Thanks for the recipe!